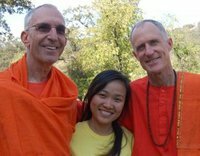 Meet our international staff: Swami Padmapadananda, originally from South Africa; Ganga visiting from Vietnam; and Swami Pranavananda from the USA. Would you like to be part of this team? Especially if you have completed our Sivananda Yoga Teachers Training Course. Open to those who are serious spiritual aspirants, and would like to have the opportunity of serving others selflessly, having time for their own practice in a friendly and welcoming community environment. If you are not ready for a staff position, you may be interested in joining our community as a contributing resident. Daily meditation, kirtan, yoga classes, and vegetarian meals provided. Check our website for details. This entry was posted in Uncategorized and tagged swami, teachers, volunteer, yoga. Bookmark the permalink.